Are you already on forced GTC? not yet also here, but soon it will be mandatory also in my ebay site. 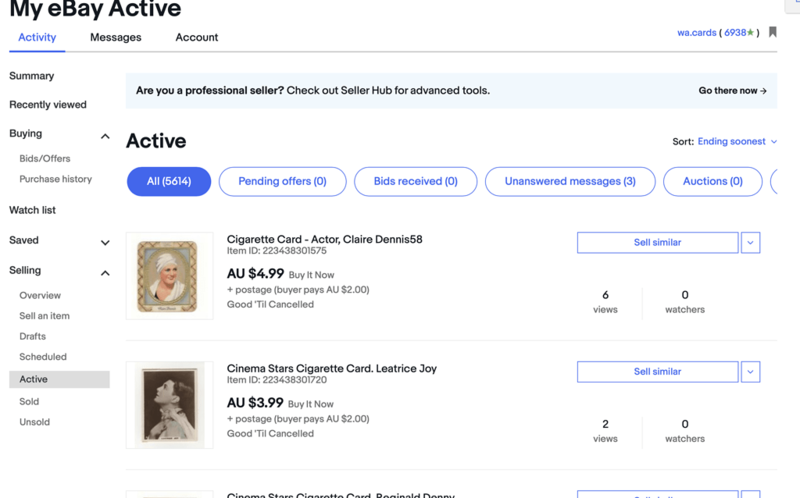 I gave up with 30-days listings about 1 year ago because with 7000 active listings it started to be quite complicated to use the GS relist feature (I also had some issues with disappearing listings, if you recall…). So I lost hopes and decided to put my goods for sale only “one time” and avoid to waste time relisting them and paying attention to not do mistakes (like relisting manually ended listings). This really reduced the visibility of my listings, but that was the only possible solution (time saved = more time to list new items), and hearing this last ebay news, it seems it was partially a good choice. Can you confirm that Ebay do not charge a listing fee for the GTL items under this p[oilcy? Well, it is quite complicated and depends on your plan. Let’s do a little example. I have a premium shop subscription that until last year let me list infinite 30-days/GTC listings without any fee. Since some time, they changed my plan and reduced the number of free listings/month to 10.000 (cost about 50€/month). This means: if I use GTC listings, all active listings implicitly renew after 30-days and so they count into the limit of 10.000 listing. If I end them before, it doesn’t matter because the count of listed listings starts when you insert a new listing, independently if you end it or not before. If I start 10.000 + 1 listings in a month, I will pay that “+ 1” also if I end it before. The count considers whole new listings ì. If it is GTC and you don’t stop, after 30-days it implicitly renew and count a fee. If it is GTC and you stop it before, anyway you pay that fee, if it exceed your monthly amount of listings. I hope it makes sense. I read somewhere that it was to be the 18th of March but I listed today ok without GTC. There is a famous Australian Band called Australian Crawl. Think they knew about the spinning beachball in GS well before their time. Pulling my hair out. Ahaha I can say the same think as soon as I receive the ebay seller email “sellers spring/autumn news”: Oh No Not You Again !!! New rule has gone into effect; obviously designed to have items roll-over and squeeze small sellers like myself to greater fees. How? I usually have 100+ items listed, many are books, that sell slowly but do sell. This will easily drive me over the 50 free every month. I am going to start a new thread to see if GS devs can eventually offer an in-app solution. AND OH BY THE WAY they WILL COUNT as new listing every 30 days; the chat quoted above was misinformation. All my 1000s of listing were changed overnight, by Ebay, from 30 Days to GTC without any notification. 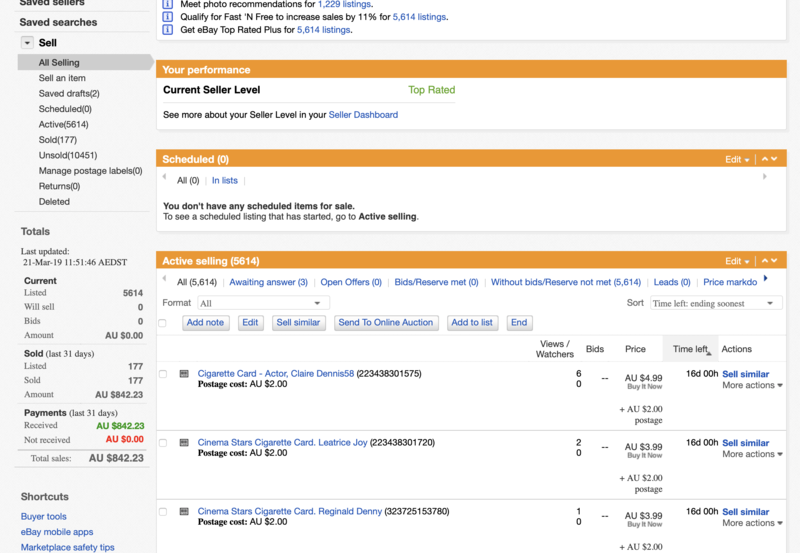 I tend to view my active listings, leave feedback via Ebay rather than via GS because it is much faster. 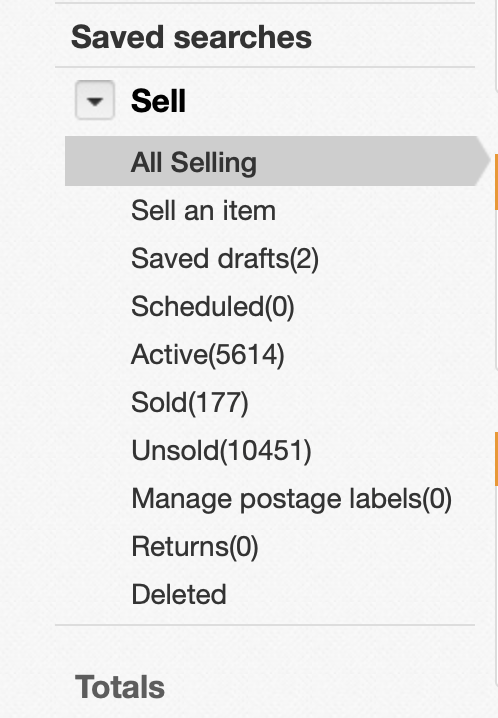 One thing I just noticed today is the slight difference between selecting “All Selling” as opposed to “Active”. One shows the auction time remaining and the other just says GTC. I am still uncertain whether to cancel them in Ebay or in GS. With 5000+ items to be cancelled each month, it will certainly be time consuming. OR. Should I revert back to 10 day actions? If I do that I will need to stagger the listings more to m are it easier for multiple item purchases. I am in a quandary . Should I revert back to 10 day actions? I don’t think that’s possible. I had a couple those this morning and got an eBay error message telling me that the 10 day fixed price listing isn’t allowed. My typo. I meant to 10 day auctions. Also I have just remembered that I turned off verification ( when starting a listing) to speed GS up. Maybe I would have also seen the messsges if I hadn’t?. I only have a 40 free listing allowances per month but I do get plenty of “unlimited” promotional offers from Ebay. If they disappear then I am screwed and may as well start looking for a new hobby.